This module follows directly from the previous one on money and the banking system. Let’s think again about the banking system and how it works. Banks are businesses, which accept deposits and make loans. The deposits come mostly from households, but every business also has one or more bank accounts. Businesses use bank accounts in the same way that individuals do—as a safe, liquid place to store savings. Individuals and businesses also use banks as a facility for making payments, through the use of demand deposits (or checks) or electronic payments (e.g. debit cards). A payment (whether check or debit) has to come from somewhere in the financial system, and banks are one way to fulfill that role. Banks earn income by making loans. They also make other safe investments, like purchases of Treasury securities, but primarily they are in the loan business. Businesses borrow from banks to finance investment expenditures and also for shorter term needs like payrolls. Households borrow from banks to finance home purchases (i.e. mortgages). Individuals borrow money to purchase cars and other vehicles. They also borrow money to pay for higher education. It is no overstatement to say that money and credit are the grease in a modern economic system, without which the economic system would operate at a much lower level. In short, banks are one part of the larger financial system, which links savers and borrowers. Savers supply the funds for borrowing and borrowers provide the demand. A key element between lenders and borrowers is the interest rate, which is the price one pays to borrow money and the reward one receives for lending. We have seen earlier in this course that interest rates play a key role in promoting or inhibiting business investment and purchases of consumer durable goods (e.g. autos) and new homes. Banks also play a key role in the payments system, by which individuals and businesses pay for their purchases. Think about how often you pay for your purchases using cash versus using checks, or electronic means (e.g. debit cards, credit cards or electronic transfers from your bank account). If you’re like most Americans, fewer and fewer of your transactions are done with cash. Suppose you suddenly didn’t have access to the funds in your bank accounts—there was no question that the money was there, you just couldn’t get access to it for six months or a year. Imagine how that would affect your behavior and you can see how important the payments system is, as well as the vital role of banks. Because banks operate using a fractional reserve system, they are always vulnerable to liquidity constraints. Banks keep only a small fraction of deposits as reserves; the rest they put to work earning income as loans or other investments. This means that on any business day, banks will have less cash on hand than the potential withdrawals of their depositors. That is just the nature of the banking business. Suppose a bank makes a bad loan, which the borrower is unable to repay. This has an adverse impact on the bank’s balance sheet. When the bad loan is written off, the value of the bank’s assets falls by the amount of the loan, and the bank’s equity falls by the same amount. Handling loan losses is one reason why banks need sufficient equity. Depositors may worry about the safety of their deposits, if their bank is making bad loans. Suppose the bank makes a bigger bad loan, where the amount is larger than the bank’s capital. When the bad loan is written off, the bank finds itself insolvent. Insolvent means the value of the bank’s assets are less than the value of its liabilities. The bank is bankrupt. Depositors are now seriously worried since, by definition, the bank doesn’t have the assets to pay off depositors in total. In this situation, whoever withdraws their deposits first receives all of their money, and those who do not rush to the bank quickly enough, lose some or all of their money. We call depositors racing to the bank to withdraw their deposits a bank run. In fact, the bank run could have happened earlier, while the bank was still solvent, but losing equity. Either way, the bank is in a difficult situation. What can the bank do? In the movie It’s a Wonderful Life, the bank manager, played by Jimmy Stewart, faces a mob of worried bank depositors who want to withdraw their money, but manages to allay their fears by allowing some of them to withdraw a portion of their deposits—using the money from his own pocket that was supposed to pay for his honeymoon. In the real world, the outcome of a bank run is likely different. If the bank is still solvent, it could attempt to raise cash by selling assets. But selling assets in a hurry risks fire-sale prices. What that means is that the sales bring in less money than the assets are worth. That could be enough to pay off enough depositors to stop the run. But it may not be since bank runs are based on emotion as much as logic. The bank could try to borrow in financial markets, but who is likely to lend to a bank in a financial crisis? If the run continues, the bank becomes bankrupt. If that were the end of the story, it would be bad enough. What if depositors of other banks become worried about the safety of their deposits? Bank runs can spread from failing banks to other banks, failing or solvent. This is called financial contagion. Systemic bank runs cause interest rates to spike as lenders become very conservative about lending. If this persists over time, these higher interest rates have an adverse impact on investment and consumption expenditure as well as the economy as a whole. Bank runs also threaten the integrity of the payments system. Checks are built on trust. If a bank is suffering from a run, other banks are less likely to accept checks written on the failing bank, even if the check writer has sufficient funds in their account. This means that transactions don’t go through and both parties to the transaction lose out. This provides an additional channel for the adverse impact of bank runs to spread. When I make a purchase from a vender, the vendor uses the revenues to pay bills. If the purchase doesn’t go through because the check isn’t accepted when the vendor deposits it into his bank, many people lose. 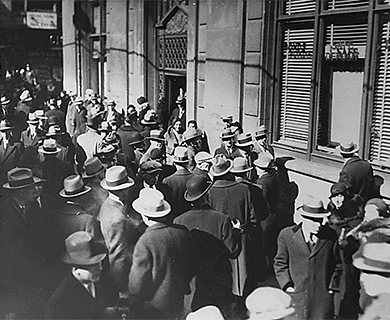 This phenomenon happened widely during the Great Depression in the 1930s, when more than one third of commercial banks failed.